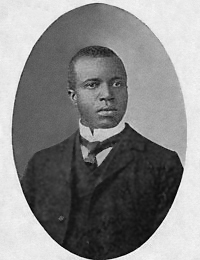 Scott Joplin (c. born 1867/1868? – died April 1, 1917) was an African-American composer and pianist. Joplin achieved fame for his ragtime compositions, and was later dubbed “The King of Ragtime”. During his brief career, he wrote 44 original ragtime pieces, one ragtime ballet, and two operas. One of his first pieces, the “Maple Leaf Rag,” became ragtime’s first and most influential hit, and has been recognized as the archetypal rag. Joplin was born into a musical family of laborers in Northeast Texas, and developed his musical knowledge with the help of local teachers, most notably Julius Weiss. Joplin grew up in Texarkana, where he formed a vocal quartet, and taught mandolin and guitar. During the late 1880s he left his job as a laborer with the railroad, and travelled around the American South as an itinerant musician. He went to Chicago for the World’s Fair of 1893, which played a major part in making ragtime a national craze by 1897. Joplin moved to Sedalia, Missouri, in 1894, and earned a living teaching piano and continuing to tour the South. In Sedalia, he taught future ragtime composers Arthur Marshall, Scott Hayden and Brun Campbell. Joplin began publishing music in 1895, and publication of his “Maple Leaf Rag” in 1899 brought him fame and had a profound influence on subsequent writers of ragtime. It also brought the composer a steady income for life. During his lifetime, Joplin did not reach this level of success again and frequently had financial problems. Joplin moved to St. Louis in 1901, where he continued to compose and publish music, and regularly performed in brothels and bars in the city’s red-light district. By the time he had moved to St. Louis, he may have been experiencing discoordination of the fingers, tremors, and an inability to speak clearly, as a result of having contracted syphilis. The score to his first opera, A Guest of Honor, was confiscated in 1903 with his belongings, owing to his non-payment of bills, and is considered lost. He continued to compose and publish music, and in 1907 moved to New York City, seeking to find a producer for a new opera. He attempted to go beyond the limitations of the musical form which made him famous, without much monetary success. His second opera, Treemonisha, was not received well at its partially staged performance in 1915. In 1916, suffering from tertiary syphilis and by consequence rapidly deteriorating health, Joplin descended into dementia. He was admitted to a mental institution in January 1917, and died there three months later at the age of 49. Joplin’s music was rediscovered and returned to popularity in the early 1970s with the release of a million-selling album of Joplin’s rags recorded by Joshua Rifkin, followed by the Academy Award–winning movie The Sting, which featured several of his compositions, such as “The Entertainer“. The opera Treemonisha was finally produced in full to wide acclaim in 1972. In 1976, Joplin was posthumously awarded a Pulitzer Prize. Joplin was born in Northeast Texas in 1867, just outside of Texarkana. He was the second of six children born to Giles Joplin, an ex-slave from North Carolina, and Florence Givens, a freeborn African-American woman from Kentucky. Although for many years his birth date was accepted as November 24, 1868, research has revealed that this is almost certainly inaccurate – the most likely approximate date being the second half of 1867. The Joplins subsequently moved to Texarkana where Giles worked as a laborer for the railroad while Florence was a cleaner. Joplin was given a rudimentary musical education by his family and from the age of seven he was allowed to play piano while his mother cleaned. At some point in the early 1880s, Giles Joplin left the family for another woman, leaving Florence to provide for her children through domestic work. Biographer Susan Curtis speculated that his mother’s support of Joplin’s musical education was an important causal factor in this separation; his father argued that it took the boy away from practical employment which would have supplemented the family income. According to a family friend, the young Joplin was serious and ambitious, studying music and playing the piano after school. While a few local teachers aided him, he received most of his music education from Julius Weiss, a German-Jewish music professor who had immigrated to the United States from Germany. Weiss had studied music at university in Germany and was listed in town records as a “Professor of music.” Impressed by Joplin’s talent, and realizing his family’s dire straits, Weiss taught him free of charge. He tutored the 11-year-old Joplin until he was 16, during which time Weiss introduced him to folk and classical music, including opera. Weiss helped Joplin appreciate music as an “art as well as an entertainment” and helped his mother acquire a used piano. According to his wife Lottie, Joplin never forgot Weiss and in his later years, when he achieved fame as a composer, sent his former teacher “gifts of money when he was old and ill,” until Weiss died. At the age of 16 Joplin performed in a vocal quartet with three other boys in and around Texarkana, playing piano. In addition he taught guitar and mandolin. In the late 1880s, having performed at various local events as a teenager, Joplin chose to give up work as a laborer with the railroad and left Texarkana to become a traveling musician. Little is known about his movements at this time, although he is recorded in Texarkana in July 1891 as a member of the “Texarkana Minstrels” in a performance that happened to be raising money for a monument to Jefferson Davis, President of the Southern Confederacy. He was soon to discover that there were few opportunities for black pianists, however; besides the church, brothels were one of the few options for obtaining steady work. Joplin played pre-ragtime ‘jig-piano’ in various red-light districts throughout the mid-South, and it has been claimed he was in Sedalia and St. Louis during this time. There is little precise evidence known about Joplin’s activities at this time, although he performed as a solo musician at dances and at the major black clubs in Sedalia, the “Black 400” club and the “Maple Leaf Club”. He performed in the Queen City Cornet Band, and his own six-piece dance orchestra. A tour with his own singing group, the Texas Medley Quartet, gave him his first opportunity to publish his own compositions and it is known that he went to Syracuse, New York and Texas. Two businessmen from New York published Joplin’s first two works, the songs Please Say You Will, and A Picture of her Face in 1895. Joplin’s visit to Temple, Texas enabled him to have three pieces published there in 1896, including the Crush Collision March which commemorated a planned train crash on the Missouri-Kansas-Texas Railroadon September 15 which he may have witnessed. The March was described by one of Joplin’s biographers as a “special… early essay in ragtime.” While in Sedalia he was teaching piano to students who included future ragtime composers Arthur Marshall, Brun Campbell, and Scott Hayden. 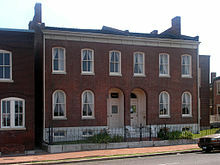 In turn, Joplin enrolled at the George R. Smith College, where he apparently studied “advanced harmony and composition”. The College records were destroyed in a fire in 1925, and biographer Edward A. Berlin notes that it was unlikely that a small college for African-Americans would be able to provide such a course. In 1899, Joplin married Belle, the sister-in-law of collaborator Scott Hayden. Although there were hundreds of rags in print by the time the Maple Leaf Rag was published, Joplin was not far behind. 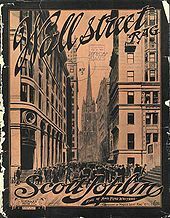 His first published rag, Original Rags, had been completed in 1897, the same year as the first ragtime work in print, the Mississippi Rag by William Krell. The Maple Leaf Rag was likely to have been known in Sedalia before its publication in 1899; Brun Campbell claimed to have seen the manuscript of the work in around 1898. The exact circumstances which led to the Maple Leaf Rag’s publication are unknown, and there are a number of different versions of the event which contradict each other. After several unsuccessful approaches to publishers, Joplin signed a contract on August 10, 1899 with John Stillwell Stark, a retailer of musical instruments who later became his most important publisher. The contract stipulated that Joplin would receive a 1% royalty on all sales of the rag, with a minimum sales price of 25 cents. It is possible that the rag was named after the Maple Leaf Club, although there is no direct evidence to prove the link, and there were many other possible sources for the name in and around Sedalia at the time. There have been many claims about the sales of the Maple Leaf Rag, for example that Joplin was the first musician to sell 1 million copies of a piece of instrumental music. Joplin’s first biographer, Rudi Blesh wrote that during its first six months the piece sold 75,000 copies, and became “the first great instrumental sheet music hit in America.” However, research by Joplin’s later biographer Edward A. Berlin demonstrated that this was not the case; the initial print-run of 400 took one year to sell, and under the terms of Joplin’s contract with a 1% royalty would have given Joplin an income of $4 (or approximately $112 at current prices). Later sales were steady and would have given Joplin an income which would have covered his expenses; in 1909 estimated sales would have given him an income of $600 annually (approximately $15,520 in current prices). 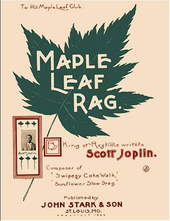 The Maple Leaf Rag did serve as a model for the hundreds of rags to come from future composers, especially in the development of classic ragtime. After the publication of the Maple Leaf Rag, Joplin was soon being described as “King of rag time writers”, not least by himself on the covers of his own work, such as “The Easy Winners” and Elite Syncopations. After the Joplins’ move to St. Louis in early 1900, they had a baby daughter who died only a few months after birth. Joplin’s relationship with his wife was difficult as she had no interest in music. They eventually separated and then divorced. About this time, Joplin collaborated with Scott Hayden in the composition of four rags. It was in St. Louis that Joplin produced some of his best-known works, including The Entertainer, March Majestic, and the short theatrical work The Ragtime Dance. During this time, Joplin created an opera company of 30 people and produced his first opera A Guest of Honor for a national tour. It is not certain how many productions were staged, or even if this was an all-black show or a racially mixed production. During the tour, either in Springfield, Illinois, or Pittsburg, Kansas, someone associated with the company stole the box office receipts. Joplin could not meet the company’s payroll or pay for its lodgings at a theatrical boarding house. It is believed that the score for A Guest of Honorwas lost and perhaps destroyed because of non-payment of the company’s boarding house bill. In 1907, Joplin moved to New York City, which he believed was the best place to find a producer for a new opera. After his move to New York, Joplin met Lottie Stokes, whom he married in 1909. In 1911, unable to find a publisher, Joplin undertook the financial burden of publishing Treemonisha himself in piano-vocal format. In 1915, as a last-ditch effort to see it performed, he invited a small audience to hear it at a rehearsal hall in Harlem. Poorly staged and with only Joplin on piano accompaniment, it was “a miserable failure”, the public being not yet ready for “crude” black musical forms, so different from the style of European grand opera of that time. The audience, including potential backers, was indifferent and walked out. Scott writes that “after a disastrous single performance … Joplin suffered a breakdown. He was bankrupt, discouraged, and worn out.” He concludes that few American artists of his generation faced such obstacles: “Treemonisha went unnoticed and unreviewed, largely because Joplin had abandoned commercial music in favor of art music, a field closed to African Americans.” In fact, it was not until the 1970s that the opera received a full theatrical staging. By 1916, Joplin was suffering from tertiary syphilis and a resulting descent into insanity. In January 1917, he was admitted to Manhattan State Hospital, a mental institution. He died there on April 1, 1917 of dementia. After Joplin’s death at the age of just 49, from advanced syphilis, he was buried in a pauper’s grave that remained unmarked for 57 years. His grave at Saint Michaels Cemetery in East Elmhurst was finally given a marker in 1974.